Presented by The Fledgling Fund January 2009 The Fledgling Fund believes that films and other media can and do have social impact, and obviously, would not be funding in this area if we thought otherwise. In our view, a well-made documentary film—especially one with a compelling narrative and well-crafted outreach plan, can serve as a catalyst to change minds, encourage viewers to alter entrenched behaviors and start, inform or re-energize social movements! Likewise, compelling photographs, short videos, radio and web-based media can be key tools in raising awareness and engaging viewers in social issues. However, we also believe that the social impact of media, particularly documentary films, is often difficult to assess and needs to be better understood and documented. In our December 2008 paper, Assessing Creative Media’s Social Impact, we put forth a framework, drawn from a combination of case studies, interviews and other research, which we will use to help us think about and assess the impact of our funding in creative media. While the complete paper is available on our website, this abridged version outlines some of its key elements. Clear Goals that are realistic and linked to the narrative and to the needs of the movement. The goals can be focused on education and raising awareness among key audiences, grassroots organizing and clear “take action” steps, movement and coalition building, as well as larger public policy goals. A Specific Plan that is based on an understanding of key target audiences and how best to reach them whether it be through traditional avenues, key partnerships or a methodical online outreach plan. Online plans should include clear strategies to engage each target audience in action, tools to monitor and report on this action in order to further engage the community around the film. The film’s website and broader online presence should be seen as far more than a parking place for information about the film. Instead, each filmmaker should be thinking strategically, and as early as possible, about building and sustaining a community of activists online. This action could be a meaningful discussion and dialogue or action-oriented requests, such as hosting a screening, donating to a cause, engagement in direct advocacy around the issue. Flexibility that allows the project to take advantage of new opportunities and partnerships, to implement action steps over time and to alert audiences to developments that may have occurred following the completion of production such as a change in circumstance related to one or more of the characters, new legislation, or new issues related to the project that are being addressed. Appropriate Level of Partnership with key organizations that have content area expertise, are already working on the issues addressed in the film and have relationships with key audiences. Partnerships are critical to a campaign’s sustainability beyond the release. Partners whose missions are aligned with the issue can carry action forward. Vital campaign resources such as guides, educational materials and material repurposed for community/educational use can support screenings, discussion and action planning. These partners can feature the film and the associated campaign on their own website and in digital communications to their membership or community. This can be a critical factor in driving new people to the film’s website and broader online presence. Sufficient Expertise and Resources including management, technical and financial. Successful outreach campaigns require ongoing coordination and commitment. In some cases, this means that outreach can be coordinated by the filmmaker or an outreach coordinator working out of the filmmaker’s office. In other cases, an external organization like Working Films, Active Voice, Outreach Extensions or others can be enlisted to design and manage the campaign. However, regardless of the model chosen to manage the outreach activities, sufficient resources are required to support the planning and implementation of the outreach campaign. Defined Timeline which can reflect different phases of a project. This can be focused around the film’s releases, such as pre-broadcast and post-broadcast activities, or festival, theatrical, digital or DVD releases or linked to the timetable of ongoing grassroots campaigns. A clear start and end to various phases, however, provides an opportunity to reflect on key lessons, impact and evolving needs of the campaign. Importantly, an outreach strategy should begin long before the actual release of the project to help ensure a built-in community for the film’s release and action campaign. Plan to Track Impact that is linked to the campaign’s specific goals and when possible moves beyond output measures such as number of screenings or website hits, toward outcome measures such as viewer action and policy change. This deeper-level impact can often be tracked through online audience engagement and anecdotally through the stories and reports that people post on a film’s website. Obviously, all of these factors are dependent on the type of outreach campaign being undertaken and they all need to fit together into a coherent whole. For example, the ability to achieve the stated goals will be guided to a great extent by the campaign’s timing, having the right partners on board, and the appropriate level of resources. Likewise, measures of impact need to flow from the goals, plans for each target audience, and the phase of campaign. Figure 1. Outreach Versus Film Promotion provides an overview of some of the different types of outreach. We make a distinction between traditional marketing, which in our view has revenue as the key goal, and the use of film as a vehicle of social change. Each campaign will have a different set of “moving parts” and will thus be customized and unique. 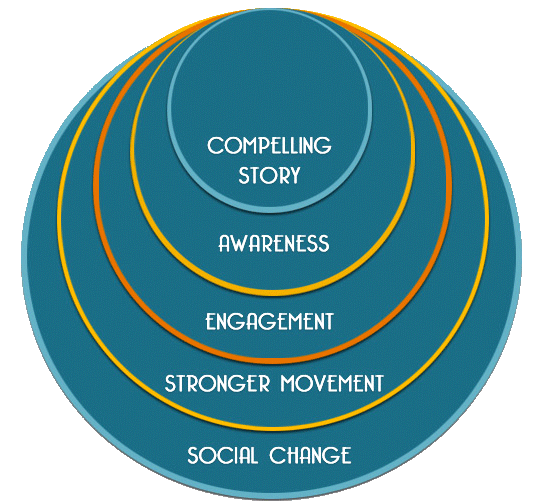 A strategic campaign can move people from awareness to action and in some cases help to build or strengthen broad social movements which in turn can lead to social change. As a funder of outreach, The Fledgling Fund pays particular attention to the goals of a film, where the issue is in the public consciousness, what audiences it is targeting and what kind of change is reasonable to expect. For each project, we strive to determine what type of outreach will be most effective given the issue addressed in the film and the film’s narrative. To read more, click here to download the PDF >> ………………….. Barrett, Diana and Sheila Leddy. “Assessing Creative Media’s Social Impact.” The Fledgling Fund. 2008.